2018-2019 Biography | Viviane Hagner | Kirshbaum Associates Inc.
Born in Munich, violinist Viviane Hagner has won exceptional praise for her highly intelligent musicality and passionate artistry. Ms. Hagner performs with "poise and magnificent assurance" (The Times/London) and "an almost hauntingly masterful display of technique and artistry" (Washington Post). As a musician of tremendous depth and integrity, Ms. Hagner has championed new works by prominent contemporary composers such as Unsuk Chin and Simon Holt while breathing new life into a diverse and vast range of repertoire. Bringing her own unique sensibility to performances, she has proven herself an artist of effortless virtuosity on the stages of the greatest concert halls in the world. Her engagements continue to highlight her demand as orchestral soloist, recitalist and chamber music collaborator. Since making her international debut at the age of 12 - and a year later participating in the legendary joint concert of the Israel and Berlin Philharmonics, conducted by Zubin Mehta - Viviane Hagner has become known for her substantial and beautiful sound as well as her thoughtful interpretations. She has appeared with the world's great orchestras, including the Berlin Philharmonic, Boston Symphony, New York Philharmonic, Cleveland Orchestra, Chicago Symphony Orchestra, Leipzig Gewandhaus, Pittsburgh Symphony, Orpheus Chamber Orchestra, Munich Philharmonic and Philharmonia, in partnership with conductors such as Claudio Abbado, Vladimir Ashkenazy, Daniel Barenboim, Ricardo Chailly, Pinchas Zukerman, Esa-Pekka Salonen, Christoph Eschenbach, Kent Nagano, Andris Nelsons and David Zinman. Recent concert highlights include engagements with Staatskapelle Dresden and Christopher Eschenbach performing Schumann’s Violin Concerto, the Montreal, Vancouver, San Diego, Vienna, Lahti and Singapore Symphonies, the Royal Stockholm Philharmonic performing Unsuk Chin’s Violin Concerto, Tonkünstler Orchestra, and a European tour with the Taiwan Philharmonic Orchestra (NSO). Ms. Hagner’s impressive 2018-2019 season brings her across Europe, North America, and Asia, performing an exciting array of orchestral and recital repertoire in both major concert halls and intimate spaces. In July, the violinist joined a band of several celebrated international artists in the closing concert at the Ludwigsburger Schlossfestspiele to commemorate the 70th birthday of Ms. Hagner’s treasured mentor and colleague, Pinchas Zukerman. As an orchestral soloist, she again collaborates with Zukerman in works of Chausson and Mozart with the National Arts Centre Orchestra in Ottawa. Additional orchestral appearances include the Brahms D major Concerto with the Kyoto Symphony Orchestra and Yoel Levi; Unsuk Chin’s violin concerto with the Oregon Symphony led by Markus Stenz; Vieuxtemps Violin Concerto No. 5 and the Saint-Saëns Capriccioso with the Sarasota Orchestra and Clark Rundell; Beethoven’s concerto with the BBC Philharmonic Orchestra and conductor Rory MacDonald; and works by Chin and Bruckner with the Polish National Radio Symphony Orchestra conducted by Alexander Liebreich. As a chamber musician, Ms. Hagner joins celebrated soloists, including cellist István Várdai, pianists Rudolf Meister and Nicole Hagner, in festivals and concerts throughout Europe such as the Kamara.Hu Festival in Budapest, Ludwigshafen, Teatro Principal de Alicante, and Festspiele Mecklenburg-Vorpommern in Putbus. A committed chamber musician, Viviane Hagner is co-founder and Artistic Director of the Krzyżowa Music Festival, a European chamber music festival in its fourth season, culminating in their late-summer tour to Poland and Germany. She has been a featured artist at renowned American and international festivals such as Schleswig-Holstein, Salzburg Easter Festival, Marlboro, Ravinia, Santa Fe and Mostly Mozart, and has appeared at Amsterdam's Concertgebouw, Barcelona's Palau de la Musica, Berlin Konzerthaus, Köln Philharmonie, London's Wigmore and Queen Elizabeth Halls and New York's 92nd Street Y. In addition to bringing insight and virtuosity to the core concerto repertoire, Viviane Hagner is an ardent advocate of new, neglected, and undiscovered music. She has championed works by Sofia Gubaidulina, Karl Amadeus Hartmann, and Witold Lutoslawski. In 2002 she gave the world premiere of Unsuk Chin's Violin Concerto with the Deutsche Symphonie-Orchester Berlin and Kent Nagano, later playing the work in Berkeley - an event which prompted The San Francisco Chronicle to praise her performance as "vibrant, warm-toned and jaw-droppingly precise [and] may well be unimprovable." 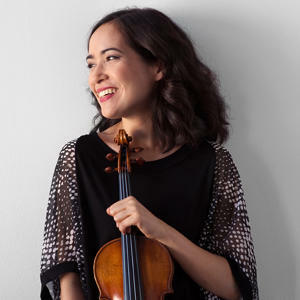 The Hyperion label has issued her performances of the Vieuxtemps Violin Concerti 4 & 5 and the Canadian company Analekta released her recording of Unsuk Chin's Violin Concerto with Kent Nagano and the Orchestra Symphonique de Montréal. Her first solo recording on the Altara label features unaccompanied violin works by Bartók, Hartmann and Bach. Ms. Hagner was a winner of the 2000 Young Concert Artists International auditions and is an alum of The Bowers Program (formerly CMS Two). "Viviane Hagner's reading of the Andante [of Mendelssohn's Violin Concerto] was a picture of melting beauty, and in the fast outer movements she played with the kind of virtuosity that makes things sound easier than they are." “[Hagner] delivered an honest-to-goodness interpretation, and a gutsy one at that, a perfect storm of passion, power and technical wizardry." OCTOBER 2018 - PLEASE DESTROY ALL PREVIOUSLY DATED MATERIALS.